Thank you. An information pack has been sent to the email address provided. Bringing together Legg Mason’s acclaimed active-management capabilities and BetaShares’ expertise in exchange traded funds, we’re pleased to offer a range of high-quality Active ETFs to help Australians meet their investment objectives. As with all BetaShares Funds, investors can buy and sell the Active ETFs on the Australian Securities Exchange (ASX). Exposure to an actively-managed and broadly diversified portfolio of high quality Australian fixed income securities. Exposure to an actively-managed, diversified portfolio of high-quality income-oriented Australian shares. Exposure to an actively-managed, diversified portfolio of ASX-listed companies holding real assets such as A-REITs, utility and infrastructure securities. BNDS aims to provide efficient access to an actively managed and broadly diversified portfolio of high quality Australian fixed income securities. The portfolio is managed by Legg Mason’s wholly owned fixed income specialist, Western Asset. BNDS aims to provide an after-fee return above the Bloomberg AusBond Composite Index over rolling three-year periods. Fund invests in a broad portfolio of Australian government, semi-government, corporate bonds and other eligible fixed income securities. Disciplined portfolio construction maintains a key focus on managing interest rate risk by limiting duration to one year away from the benchmark. Income paid monthly, and expected to exceed income paid on cash and term deposits. EINC aims to provide an after-tax income yield above the S&P/ASX 200 Index and to grow this income above the rate of inflation. The Fund invests in an actively managed portfolio of income oriented Australian shares and is managed by Legg Mason’s wholly owned equity specialist Martin Currie. EINC aims to deliver an attractive and growing income stream by investing in high-quality Australian companies, whose cash flows are matched to consumer spending patterns and that the Investment Manager believes have the potential for long-term income growth. EINC aims to deliver lower volatility than the S&P/ASX 200 Index over time through active stock selection and relatively lower single stock and sector concentration. The Fund does not use any derivatives to generate income and employs a methodology that optimises for after-tax income, and aims at maximising franking credits for investors. 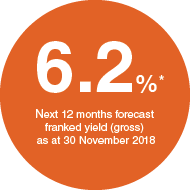 *The yield forecast for the next 12 months is calculated using the weighted average of broker consensus forecasts of each portfolio holding and research conducted by Legg Mason Australia, and excludes the fund’s fees and costs. Franking credit benefit is based on the fund distribution and assumes a zero tax rate. It is not to be interpreted as the offset achieved by unitholders during this period. Actual yield of EINC may differ due to various factors, including changes in the prices of the underlying securities and the number of units on issue. Neither the yield forecast nor past performance is a guarantee of future results. Not all investors will be able to benefit from the full value of franking credits. RINC invests in a blend of property, infrastructure and utility companies listed on the ASX that generate income levels that are expected to rise with inflation. By investing in a broader universe beyond A-REITs the Fund provides sector diversification to portfolios, while maintaining exposure to real assets. RINC invests in high quality Australian real asset securities, and so targets lower volatility than the broader Australian sharemarket. 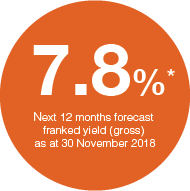 *The yield forecast for the next 12 months is calculated using the weighted average of broker consensus forecasts of each portfolio holding and research conducted by Legg Mason Australia, and excludes the fund’s fees and costs. Franking credit benefit is based on the fund distribution and assumes a zero tax rate. It is not to be interpreted as the offset achieved by unitholders during this period. Actual yield of RINC may differ due to various factors, including changes in the prices of the underlying securities and the number of units on issue. Neither the yield forecast nor past performance is a guarantee of future results. Not all investors will be able to benefit from the full value of franking credits. There are risks associated with an investment in the Funds, including market risk, individual security risk and investment manager risk. For more information on risks and other features of each Fund, please see the PDS.